We have an inter-connecting couples therapy room on our upper floor. treatment room for four people. LEHA-LEHA spa can cater to your requirements. arrange for any special refreshments while you enjoy your treatments. Please click on the package buttons below to see what we have to offer you. A custom designed Balinese Massage using our organic oils and specialised acupressure techniques to stimulate blood flow, which in turn oxygenates your blood and helps balance your energy centres and gets deep into the muscles creating serious relaxation! Particularly good before or after a flight. Neck, Shoulder & Back massage. 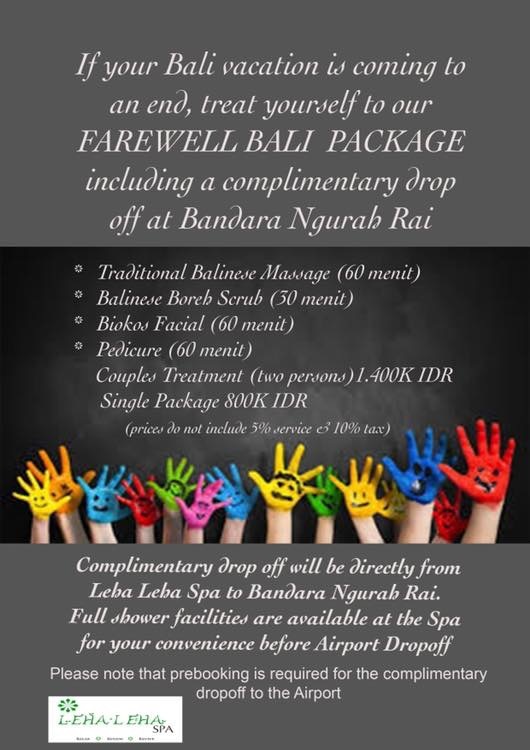 2 therapists will work on your hands and feet simultaneously (add 60.000 IDR/15 Minutes for French/Flower Nails, Hands & Feet). The "Spirit of Nature" breakfast at Art Cafe Sanur including transfers.